Will plan for Rohingya repatriation work? Home / Opinion / Will plan for Rohingya repatriation work? On October 30, Bangladesh and Myanmar reached an agreement to begin the repatriation of hundreds of thousands of Rohingya Muslims who fled to Bangladesh to escape a Myanmar army crackdown last year. On the other hand, Chinese State Councillor Wang Yi during his meeting with the Bangladesh foreign secretary in Beijing on November 9 said China is “happy to see” the two countries reaching the agreement to start repatriation which he described it as important progress toward resolving the Rohingya crisis. Now the immediate question is whether the refugees will be repatriated by mid-November as per the agreement. And why is the repatriation being rushed through by Bangladesh and Myanmar when the UN refugee agency is against the move? On October 31, a day after the repatriation agreement, an 11-member team from Myanmar led by Myint Thu and another 11-member group from Bangladesh visited Kutupalong, the world’s largest refugee camp, and a settlement housing Hindu refugees from Myanmar. The visit was primarily an attempt to talk to the refugees and address their concerns, and also to inform them, if not convince them, about the two governments’ plan to begin the repatriation process this month. Other demands include compensation and reparations for lives lost, injuries inflicted, and property confiscated; the release of Rohingyas arbitrarily imprisoned in Myanmar and the removal of innocent people from the lists of terrorists; the return of original homes and lands to refugees; and the lifting of restrictions on their movement and access to basic services. At the moment, it is unclear whether the Myanmar government is committed to granting these demands. Even if the civilian government of the National League for Democracy is willing to accept some of these demands either because of international pressure or on humanitarian grounds, it is unlikely that the Myanmar military and the country’s nationalists or ultranationalists will support such an idea. But despite the concerns expressed by the UN refugee agency and other human rights groups, the repatriation could go ahead if both Bangladesh and Myanmar choose to do so. In the past, Bangladesh had said that it would not put unnecessary pressure to forcibly repatriate the refugees. Myanmar has said that it has verified 5,000 Rohingyas eligible for repatriation from a list of over 8,000 names which Bangladesh had submitted in February, and that the first batch of returnees would consist of 2,000 of them. Now the intriguing question is why is the repatriation rushed through by Bangladesh and Myanmar when the UN refugee agency is against the move? In this regard, it is quite evident that both countries have come under different pressures. 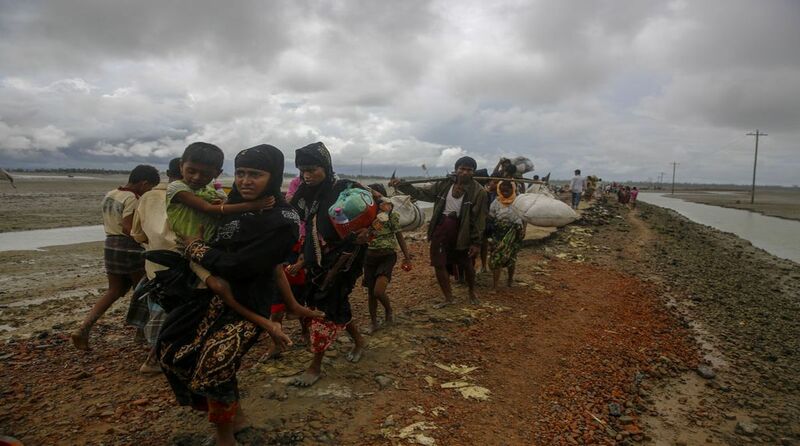 Perhaps Myanmar felt the pressure more when judges of the International Criminal Court (ICC) authorized its chief prosecutor, Fatou Bensouda, to investigate the massive displacement of the Rohingya people despite Myanmar not being a member state of the court. The ICC prosecutor said her investigation would include the deprivation of fundamental rights, killing, sexual violence, enforced disappearance, destruction and looting. Such initiative sends a powerful message to the international community, particularly the Western democracies, to limit their engagement with Myanmar, including economic and military relations. On the other hand, Bangladesh also has its own pressures. Bangladesh is a relatively small country with limited resources of its own to accommodate another million or more so people. Prime Minister Sheikh Hasina and her ruling Awami League feel the pressure from the voters ahead of elections next month. Hasina would like to send an unambiguous message to the country’s electorate that her government is only providing temporary refuge to the Rohingya refugees. The Hasina government has been frustrated with the Myanmar government. She has criticized Myanmar for delaying the repatriation process. When the Myanmar government is coming forward to take the refugees back, it appears that Bangladesh is happy to jump on board despite the criticism by the UN refugee agency and other human rights groups. Given the pathetic situation of the Rohingyas in the Rakhine state and the refugees’ lingering fear and their reluctance to return, it may be premature to begin the repatriation at this point. Moreover, any dignified repatriation ought to be done with the involvement of UNHCR and UNDP, with which Myanmar signed an MoU in June this year. But it is unclear whether the Rohingyas will eventually get full citizenship. Even if they are given the citizenship, it is unclear whether they will be recognized as ‘Rohingya’ or ‘Bengali’. While the refugees want that they be officially recognized as ‘Rohingya’, it is unclear whether the Myanmar government will be willing to go far enough to accept such a demand. There is a possible disagreement on the issue between the civilian government and the military, which still holds significant political power. The other question is whether Rohingya or Bengali, whichever they will be officially recognized as, be listed as one of the ethnic groups of Myanmar. In order to do this, the 1982 citizenship law needs to be amended, which will be almost impossible without the support of the military, which takes a hardline approach on the issue. The writer is Associate Professor and Executive Director of the Center for Southeast Asian Studies, Jindal School of International Affairs, O.P. Jindal Global University. He is the author of three books on Myanmar, including ‘Democratization of Myanmar’.